The use of masquerade masks dates back to 1268, in Venice. Masks were used during the celebration of carnival, the annual celebration of the election of Doge Vitale Michieli. People from Venice also use masks during other festivities such as weddings. Eventually, royalties all across Europe adopted the Venetian tradition of wearing masks. It has become a custom to wear masks in masquerade balls since the 17th and 18th centuries. Venetians popularize the use of masks to allow commoners to mingle with upper class citizens. Unfortunately, some people also use masks as disguise when they commit immoral acts. Masquerade-style masks are also important in improvisational theaters. These are useful in reflecting emotions including love and jealousy. Venetians designed masks that mimic various characters and these are used in plays during various celebrations. However, the use of masks stopped after the Austrians had control of the city in the late 1700’s. Later on, a group of artists rekindled the popularity of masquerade masks, and they created several other types and designs of masks. At present, masquerade masks are common during festivals such as the Venetian carnival. In some unconventional masquerade weddings, the bride opts to wear a mask instead of a veil. Teenagers also use masks for costume parties or prom. You may also see masks worn in other countries including the Chinese New Year celebration. In the United States, people parade in masks during Mardi Gras, in New Orleans. When not used during parties, masks are worn by those who perform in theaters. The mask depicts the performers’ emotions, and you can see masks in various designs and colors. In other cases, masks serve as artwork pieces or decorative items at home. 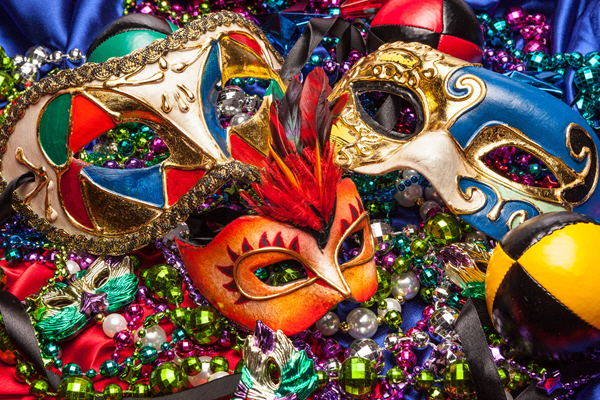 Most Masquerade masks are made of paper-mache, or bird feathers covered in colorful crystals or rhinestones. There are also masks made from leather, wax, or velvet. Inexpensive masks may be constructed from a synthetic shell that matches the curve of the face and the more luxurious masks can be made out of metal and cut with a laser. Artists embellish the mask with paint, fabric, jewels, and various types of materials. They also use different color combinations to give the mask an extraordinary look. Ribbons may be used in securing the masks to the wearer. Some masks only come with an elastic band, while others are held with a stick. The popular types of masquerade masks include the full face, head, half face, and stick mask. Men and women use masks to add an interesting appeal to their overall look for the costume party. This type of mask is designed to cover the entire face. It comes with two holes for the eyes, and an additional hole for the mouth. It is useful for giving the wearer a mysterious appeal. A mask without a hole for the mouth is not practical to wear, though. These restrict people from drinking and eating properly, unless they remove the mask. The half face masquerade mask covers the upper half of the face. Some variations of the mask cover the eyes and temples. This design offers practicality to the mask because the wearer can talk, eat, and drink with ease. The stick mask is another type of masquerade mask. It does not conceal the identity of the person, though. In addition, the wearer is required to hold the mask up to the face. The only drawback is that it is inconvenient to hold the stick when concealing the face. Nevertheless, stick masks enable the wearer to eat and drink efficiently because of the ease in removing the mask. Masks give people an interesting and mysterious appeal. These are popularly used in costume parties, balls, and theaters. These masks are also used in various festivities including Mardi Gras, Carnival, Chinese New Year, and several others. In some instances, people also choose to buy masks as decorative items for their homes. Be the first to comment on "Facts About Masquerade Masks"